Havant were crowned county champions for the 19th time after beating Bournemouth 25-0 in the Hampshire Cup final at Hooks Lane on Saturday. Head coach Will Knight felt it was an emphatic win against opponents who play at a higher level. Overall it was a good day for the hosts – with the occasion well supported by fans of both clubs. ‘We have to be very pleased with the performance and the outcome,’ said Will Knight. ‘Most would say that we edged every aspect of the game by the end. ‘We were dominant at the set-pieces and particularly overpowered them in the scrummage. ‘In the first half – when they threw everything but the kitchen sink at us – we were defensively very sound. ‘Then when our opportunities came along we took them very well. In the opening 40 minutes, Bournemouth had the majority of possession – running hard, looking for the breakthrough. But Havant showed no chinks in their defensive armour. The hosts maintained their organisation, kept their defensive systems intact and put in an impressive tackle count. In the first half, the only score came on 25 minutes courtesy of a Joel Knight penalty. ‘At half-time we felt we could go on and win the game,’ added Will Knight. ‘On paper, Bournemouth should have been too good for us. ‘And we maybe gave them a bit too much respect at the start. Havant started the second period strongly, with Darren Bamford held up over the goal line. There was no denying Bamford a minute later, though, after the forwards had hammered at the visitors’ line and sucked their defence in. When the ball was spun out, Bamford scored in the corner and Joel Knight added the conversion to stretch the lead to 10-0. A lovely chip over the top by Joel Knight then set up Scott Morris for a further try – with the former again adding the extra points. Veteran replacement scrum-half Grant Morris helped set up the final try, scored by Harrison Young. 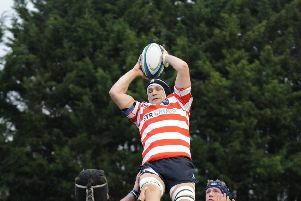 ‘It was a pleasant break from league rugby and a good occasion for the club,’ said Will Knight. ‘There was no pressure and little to play for but for pride. ‘We also wanted to maintain our excellent record at Hooks Lane. ‘The style in which we won was most pleasing. ‘It will be a shame if days like this are to become a thing of the past (with the future of the cup being debated).